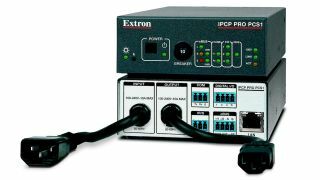 The What: Extron has begun shipping the IPCP Pro PCS1 high-performance IP Link Pro control processor with AC power and device control. The What Else: Featuring IEC power connectors and rated for 100-240VAC, 50/60Hz operation, the IPCP Pro PCS1 provides worldwide compatibility. The compact IPCP Pro PCS1 features advanced security standards and gigabit Ethernet, enabling compatibility with multiple TouchLink Pro touchpanels using a standard network infrastructure. It also supports Extron LinkLicense, which further enhances the capabilities of Extron Pro Series control systems. The Extron IPCP Pro PCS1 can be configured using Global Configurator Plus or Global Configurator Professional software or programmed using Extron Global Scripter. For enterprise-wide applications, GlobalViewer Enterprise can provide centralized AV resource monitoring, management, and control over a computer network. A wide range of control ports, including bidirectional RS-232, IR/Serial, digital I/O, and eBUS make this a powerful control processor for a wide variety of presentation rooms and modern workspaces. The Bottom Line: The IPCP Pro PCS1 control processor combines a variety of AV control ports and the ability to supply and manage device power, and is well suited for controlling multiple devices and control signal types, as well as device power within an AV system.